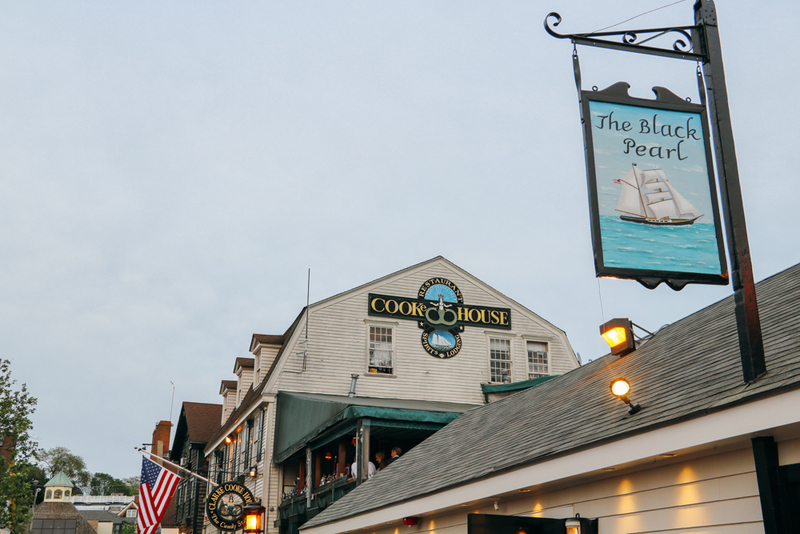 There are few places as magical as Newport, Rhode Island. A handful of years ago when I was living in New York City, my mom came to visit and we went on a road trip up through New England. I have such fond memories of that week exploring quaint seaside towns, taking in the beautiful coastline and stopping at what felt like every Dunkin Donuts along I-95 for iced coffee and a box of Munchkins. Aside from quality time with her, the highlight of that trip was experiencing Newport for the first time, and I knew I'd make it a priority to one day return. 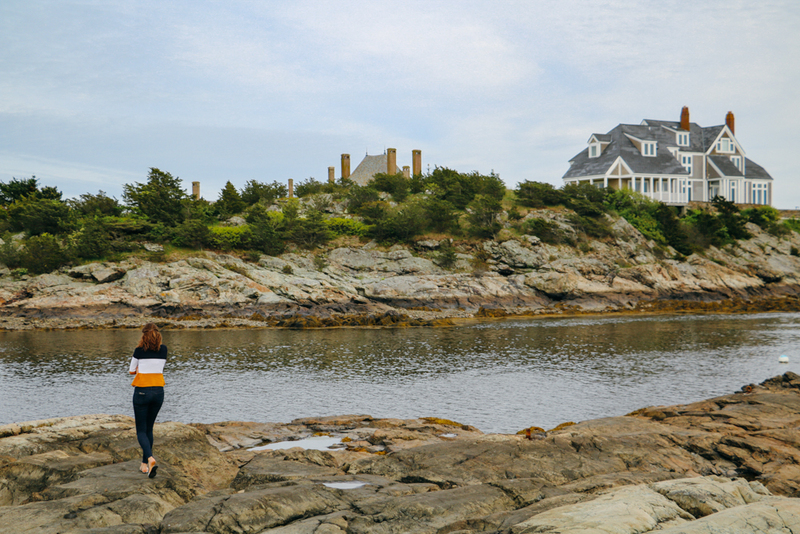 During our trip to Rhode Island over Memorial Day Weekend, Greg and I made the magnificent Ocean House resort in Westerly our home base - a perfect distance for a day trip to Newport! The weekend was sunny and cool with high's in the 60's. Perfect sweater weather! Before we left for the trip, I swung by Ann Taylor to pick up a few new pieces and instantly fell in love with this peplum sweater jacket. Between the bold stripes, which felt nautical without going overboard (no pun intended! ), and the rich texture, it seemed perfect for a day of sightseeing in the Northeast. I have a hard time saying "no" to stripes and statement jewelry, and Ann Taylor has so many great options this season, most on sale! Links to my look and more below. 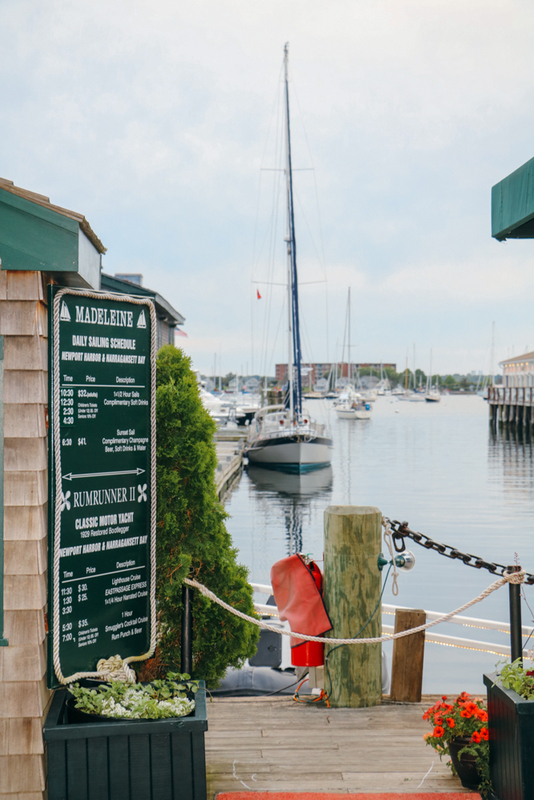 With so much history and charm, Newport offers a wide array of activities and sightseeing. In my opinion, a long weekend is the perfect amount of time to take in this lovely town, although so much can be accomplished if you only have a day. Below is my guide on how to have the full Newport experience in 12 hours. 9AM- No trip is complete without reliving the Gilded Age with a visit to the famed Newport mansions, and this is how I recommend starting your day. 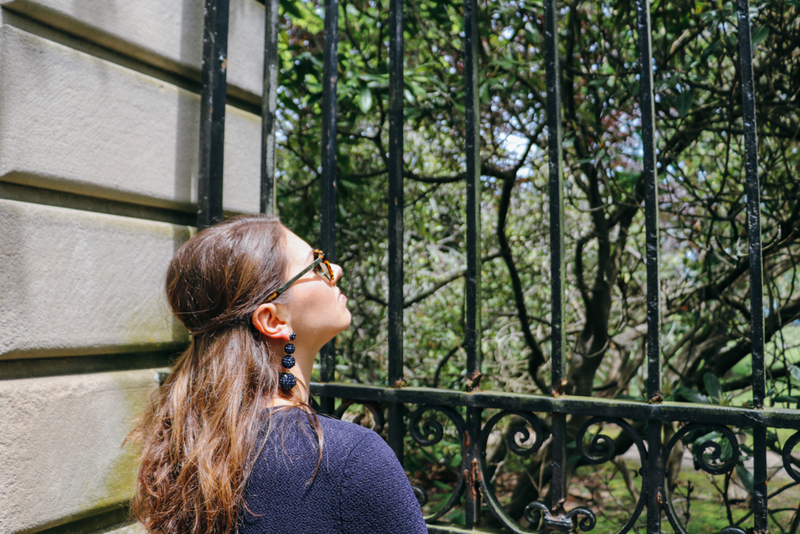 The most popular home to visit, and rightfully so due to its grandness and history, is The Breakers. But, my advice would be to start at one of the other 10 mansions, where you can buy a ticket good for multiple houses, and skip the long lines at The Breakers! Or, even better, buy tickets online in advance. In my opinion, the Two-House Ticket is the best option, as you get a good glimpse into the glamorous era without taking up the whole day. 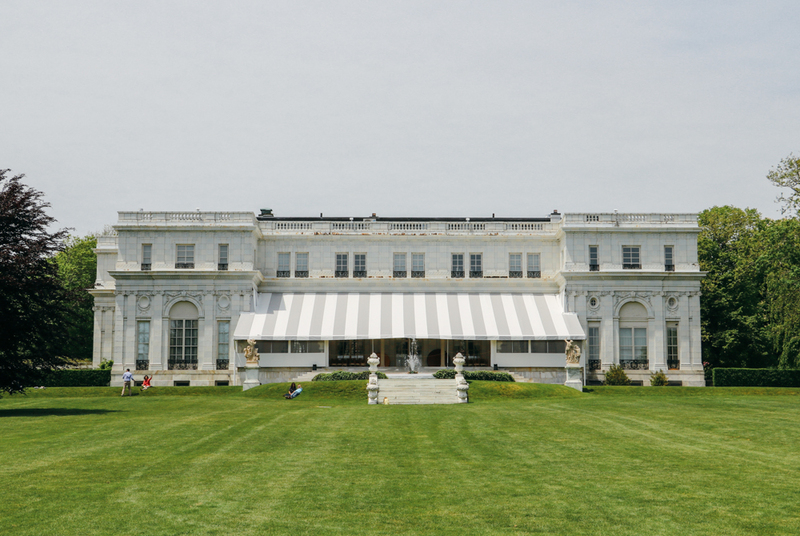 We started at my favorite, Rosecliff, where scenes from the original The Great Gatsby were shot, and then proceeded to the Vanderbilt family's "summer cottage". The manicured grounds of these mansions are just as impressive as the interiors, so make sure to stroll them before leaving! 12PM- No trip to New England is complete without some fresh seafood! I'm embarrassed to admit how much lobster we ate over the weekend, and one of my favorite meals was at Newport Lobster Shack. It's literally just a shack with a limited menu, but is right on the water and has delicious, local seafood. The perfect lunch location! 2PM- From there we decided to get a better sense of our surroundings. One of my favorite things about Newport is the architecture, both old and new, and the best way to take it in is with a drive down Bellevue Avenue, which turns into the renowned Ocean Drive, just minutes from downtown. This route offers excellent views of the coastline and the gorgeous estates that hug it. Plus, you can pull off at Brenton Point for a picnic or fishing on the Atlantic. 4PM- At the far end of Ocean Drive you run into Castle Hill Inn, a historic estate turned luxury hotel situated on 40 acres overlooking Narragansett Bay. While the accommodations are fabulous, those on a tighter timeline can still experience it by stopping in for a pre-dinner cocktail and appetizer on The Lawn. Pull up an Adirondack chair, sit back and enjoy sailing regattas, ocean breezes and stunning views of the water. 6PM- Finish the day at Newport's anchor, Bowen's Wharf, which offers plenty of shopping and excellent restaurants. A few of my favorite shops are Soap and Water for fine bath and body products and Kiel James Patrick for timeless American-made fashion and accessories. We had a great dinner (of more lobster!) at Clarke Cooke House, followed by one-too-many cookies from The Cookie Jar. If you do plan to stay overnight, I can't recommend The Chanler at Cliff Walk enough! My mom and I stayed at this gorgeous estate during our trip in 2012 and loved every moment of it. As the only hotel located on Newport's famed Cliff Walk, it is the ideal location and choice for a retreat that is quintessentially Newport!